Sunbeds available to book at exclusive prices. Purobeach Barcelona is the perfect place to spend the day immersed in an oasis of happiness. 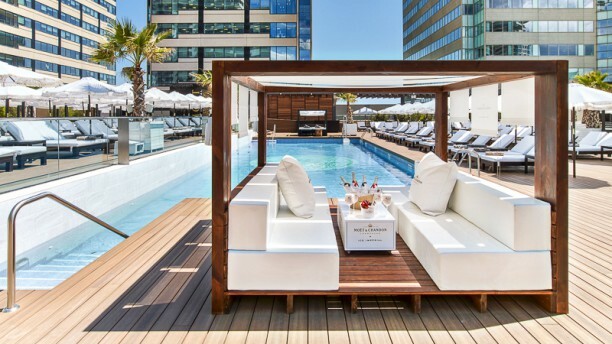 This urban oasis located in Hilton Diagonal Mar Barcelona, offers a real world of sensations. To its select cuisine and music, you can add the pleasure of the spa, with a large selection of relaxing treatments. Their menu includes salads and fresh seafood such as grilled lobster. In its classic section, you will find specialties such as Puro Burger and among the meats, the presence of entrecote grilled is a whole lot. Immerse yourself in the international from its proposal. Pastas, curries and woks prepared with care and tasted with passion. Expensive and overpriced food that wasn't even worth the wait!